Deep, dark, sweet, ripened blackberries with just a subtle hint of tartness. 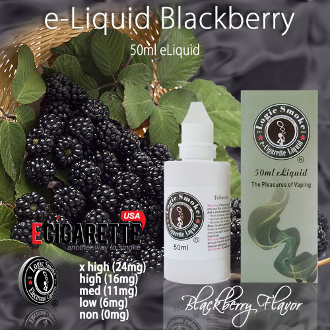 The Blackberry e cig juice is a top seller in our store. This e juice is a favorite amongst many of our customers. It has an incredibly pleasant flavor that doesn't overwhelm. It mixes well with so many of our other Logic Smoke flavors. Blackberry makes a tasty vaping treat when combined with apple and cheesecake. Try it with Mango, pomegranate or grape or mix with what strikes your fancy. With the perfect blend of an 80/20 PG/VG mix e cig juice (propylene glycol and vegetable glycerin: organic, food grade preservative compounds), you'll get the best flavor concentration along with the perfect amount of vapor to satisfy your vaping needs.